0 Comments Published by Matt on Thursday, February 28, 2008 at 9:18 PM. 2 Comments Published by Matt on Friday, February 22, 2008 at 9:57 AM. I had this past week off from work. It's been really nice, sleeping in a little bit later, seeing lots of real estate, drinking a ton of coffee and just generally mackin'. Amanda had Tuesday off too, so we decided to take our first trip over to Inspaworld. This is a Korean five-floor spa mecca, which reminded Amanda of similar establishments in merry ol' Japan. They have very strict rules there, including no photography so you'll have to use these promotional shots from their website and add in some of your own imagination. First thing you should know, when you get there they give you an electronic bracelet that controls everything, including paying for food & drink through the day (it looks like a swatch watch with no clock on it). You go into the locker room, and use your watch to unlock your shoe bin and then your locker. Then you put on your Man uniform which is blue shorts and a beige shirt - different than the Woman uniform of orange shorts and a red shirt. Once you've suited up you're ready to hit the spa. This isn't a spa in the traditional new-age, mud bath, eucalyptus smellin', feel goodery sense. THIS IS THE FUTURE! On the first floor you have an option of seven themed sauna huts where you join other guests, mostly Korean, and either lie on the floor or crouch in a ball. I enjoyed the Salt Sauna and LED Light Sauna's most, while the Mrs. liked the Jade and Gold Saunas. Again, everyone is wearing the same uniform so there's this feeling that you're on The Island or something. It's crazy. As we walked upstairs we noticed that there are leather recliners everywhere where people are enjoying a lil' nap for themselves. This place is relaxation central. Next floor up are the indoor and heated-outdoor pools. It was just warm enough for us to run outside to the pools, and I'm sure glad we did. If you associate laps, horse-play and Marco Polo with being a pool, you're in for a shock at Inspaworld. There are no fewer than 10 electronically controlled gadget areas all over the pool, most of them relying on some sort of super-sonic jet power. You can lie down in a Dream Chair, in the water mind you, where with a touch of your hands jets blast you in just the right places. They've installed currents in the pool to carry you from section to section (we called this the Lazy River). It's awesome! After enjoying all that the pools had to offer, we split up and took in the rest of the sights. I did a short workout in their fitness center, while Amanda enjoyed the female only saunas and bathing areas in the women's locker room. We regrouped later, had some delicious Korean food and sushi and called it a day. Here's the kicker - for access to all of these wonderful delights it costs $30 per person! That's for the use of all the facilities - you only get charged extra for anything you eat or drink, or any massages you want. Amazing and cheap! 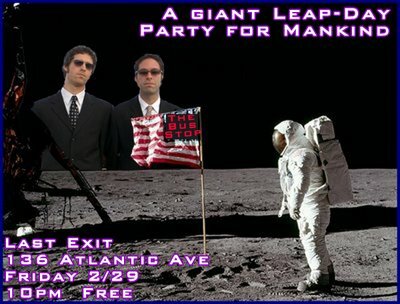 If you have the means I highly recommend you get over there - it's a quick drive out of Manhattan, just before the Whitestone Bridge in Queens. In the next few weeks we'll be looking to get a big crew to go - this is one of these special New York City experiences, where you can't quite believe where you are, what's happening, and mostly that you are still in New York City! Treat yourself to Inspaworld - you'll be glad you did. 0 Comments Published by Matt on Wednesday, February 13, 2008 at 10:31 PM. Love this "I am Not a Paper Cup" Cup. 0 Comments Published by Matt on at 7:12 PM. Some of you are familiar with my boy Ian (DJ Ranztron if you're nasty). Among other roles, he is one half of the Bus Stop crew. Ranztron went and got himself a new website where he dissects the finer points of deep-cut music. Its' called, appropriately enough, Groove Food. The name harkens back to the radio-show he and I did in Vermont together. Yeah, you know you still have the cassette tapes of our shows at the bottom of your closet. So swing on by Groove Food and see what the Ranz has to say. 0 Comments Published by Matt on Monday, February 4, 2008 at 6:22 PM. morning. 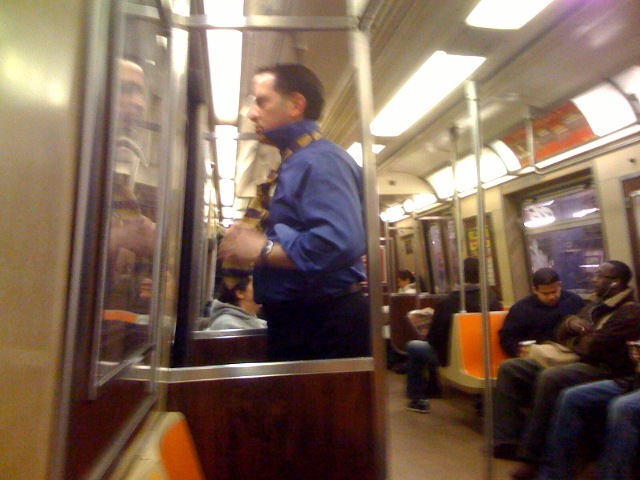 Here he is tying his tie using the subway door as a mirror.